In Montreal, some folks are working to change the way we interpret and think about video games. The city’s skyline was an ideal backdrop for the first ever Artcade that took place on the 11th floor of the EV building on March 2. Game developers and attendees alike quickly filled the lounge space. Artcade, which was part of the Montréal Joue festival, was an experimental video game exposition that showcased projects that had been created by local indie developers that subvert the mainstream. The event was organized by FLOP, a monthly meetup that encourages developers of all levels of expertise to participate in a show and tell. 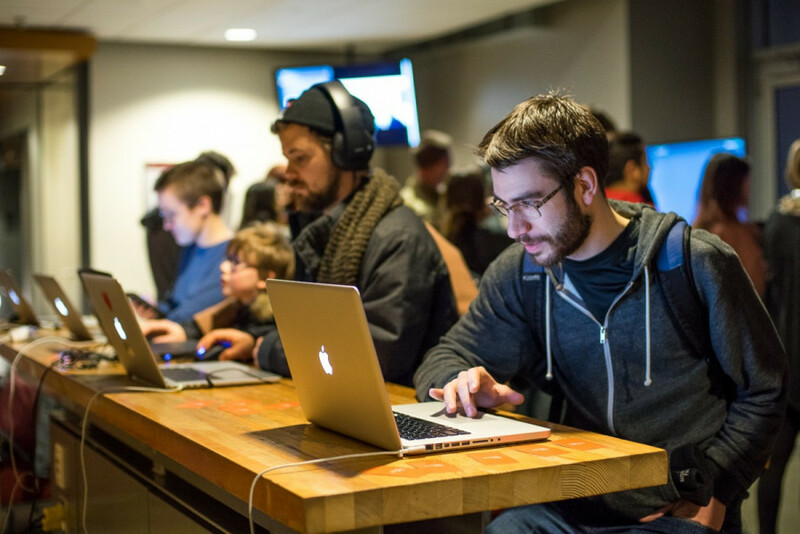 A group that also had a hand in putting this event together was TAG labs, which is a research center at Concordia that offers students majoring in game studies, a platform for interdisciplinary collaboration in digital game studies and design. The key organizers of the event were Simon-Albert Boudreault, a Concordia student in Computation Arts and founder of FLOP, and indie game developer Alvaro Salvagno. Both of whom had their own projects on display at Artcade. 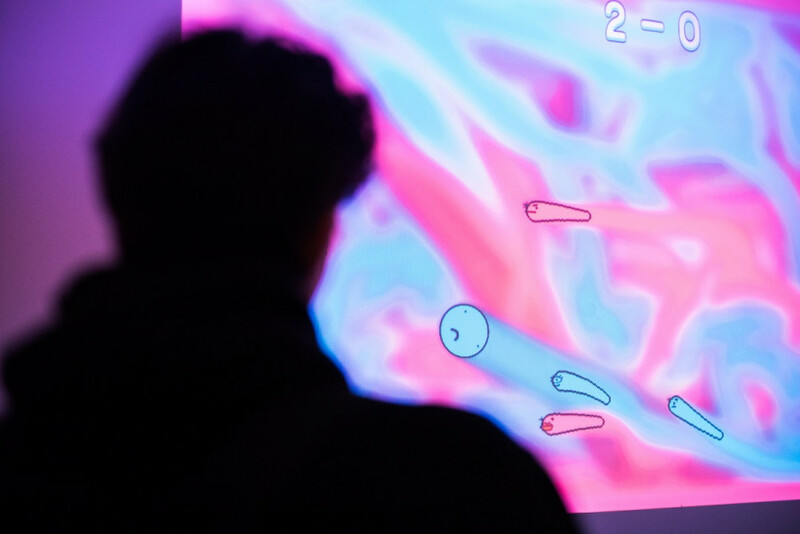 What a lot of the featured game developers aimed to bring to Artcade was to deviate from the conventional way of how games are thought of, and going about it at a different angle. The intimate nature of the event enabled creators to engage with players. For several of the developers, it was their first opportunity for their game to receive public exposure. This was the case with FLOP game developer Phil Grenon’s project, Everything Die, a seemingly simple yet intelligent game where the user navigates through the game as a dice. Grenon said that aside from some of his friends and fellow game developers, I was the first to try out his game. Sam Quino, a member of FLOP and community manager for the game developing team of Scavenger Studio, had her game Miss Fit on display. It allowed the player to explore a jigsaw puzzle, which is normally a two-dimensional object, from an immersive perspective. Quino explained that the whole point of Miss Fit revolves around looking for a place for the player to fit in. You find and dictate where you feel like you belong the most. At the end of her game, the user is prompted with the question, “Miss Fit fits?” as if only the user can conclude if he or she has found satisfaction in experiencing the puzzle. Ivanov’s game, DotCycle, is more of a philosophical experience. The player, as explained by Ivanov, is an operator of sorts going through archived memories of an artificial intelligence. Ivanov’s approach to making a game is inventive. Sentience, freedom of will and purpose are examined in three chapters. While many of the games featured at Artcade dealt with complex issues important to the developers, a few more lighthearted ones found themselves in the mix. Hyper Realistic Dating Simulator 2018, developed by Julian Nasielski, makes users go on virtual dates. Then there’s It is as if you were doing work, developed by Pippin Barr who is an assistant professor in Design and Computation Arts at Concordia, is an addictive retro desktop simulation game designed for an age when robots take over the planet and humans no longer work. It gives the player validation for completing mundane tasks such as clicking and typing. Both games got their share of laughs from attendees. Despite the diverse range of games at the event, artistic ingenuity was consistent. Ivanov believes that games give people the opportunity to express something through a system and allow the player to experience an art piece for themselves rather than viewing it passively. In the future, FLOP envisions integrating these independently made games into gallery spaces for more conventional art where a broader audience could try them.